Nothing new, this is FIFA! Manchester United fans have been left fuming as Henrikh Mkhitaryan’s scorpion kick goal against Sunderland failed to make the FIFA Puskas Award nominations list despite Olivier Giroud’s similar strike for Arsenal against Crystal Palace made it on, Metro reports. The award was established at the behest of then-president of FIFA Sepp Blatter in order to award the player, male or female, judged to have scored the most aesthetically significant, or "most beautiful", goal of the year. The Armenia international showed remarkable skill and improvisation to acrobatically find the back of the net in a 3-1 win over the Black Cats on Boxing Day last year, after the nominations for 2016 had already come in. Mohd Faiz Subri won last year’s edition of the prize, and was presented with the trophy at the awards ceremony in January. While Mkhitaryan’s goal came a little late for it to earn a nomination last year, it is not clear why it has failed to make it among this year’s contenders, which judge strikes from the last twelve months of football around the world. Neymar’s goal for Barcelona in a 3-0 win over Villarreal was one of the nominees for the 2016 prize, despite coming in November 2015, so it may be that FIFA have judged Mkhitaryan’s not to fit their official criteria. 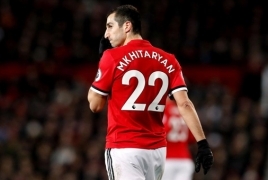 MUTV‘s new feature documentary ‘Micki: An Armenian Hero’ premieres on Thursday night, providing a detailed analysis of Henrikh Mkhitaryan’s story, according to Manchester United’s official webpage. 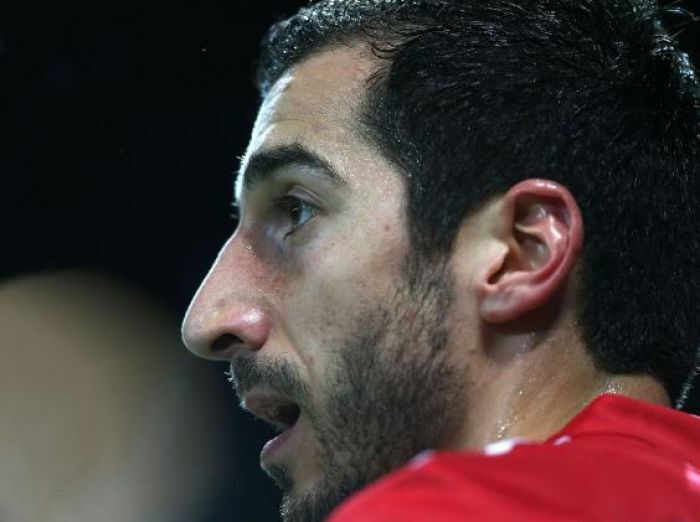 Filmed in Yerevan and Manchester over recent months, the documentary exposes the depth of Henrikh’s influence on his homeland, while also shedding light on his compelling background. José Mourinho wherever he went, he ruined the chemistry of the team by creating a fake rivalry that resulted in disharmony. If Mkhitaryan is that bad how come ten teams are interested in him? The real reason because Henrick didn't vote for him for the coach award because he is not a good coach just a mean spirited person. Several football clubs closely follow the developing situation regarding Manchester United (England) midfielder Henrikh Mkhitaryan. Ten teams, four of which from the English Premier League, are interested in the services of the 28-year-old captain of the Armenian national squad, according to Daily Star newspaper of the UK. In recent times, Mkhitaryan is not getting much playing time at United. And manager José Mourinho recently announced that Manchester United will try to sell the Armenia international in winter. The Red Devils assess his transfer value at £35 million. 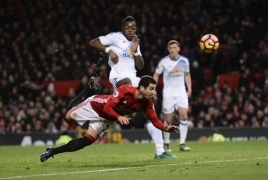 PanARMENIAN.Net - Armenian midfielder Henrikh Mkhitaryan reportedly said a tearful farewell to his Manchester United team-mates and club staff on Friday, January 19 lunchtime as the final obstacle to United signing Sanchez was removed. According to a source familiar with the matter, Mkhitaryan isn’t too happy with the way the deal "has been forced upon him," The Daily Mail reports. Alexis Sanchez will finally become a Manchester United player after Mkhitaryan agreed to join Arsenal in a swap deal. The Armenian’s switch has been holding up negotiations after his agent Mino Raiola warned that he could scupper the Sanchez deal. An hour after Jose Mourinho confirmed Mkhitaryan would be left out of United’s squad to face Burnley, MailOnline revealed that the player had said an emotional goodbye after his final United training session. "It was very tearful,’ said a source. "Henrikh has been a very popular figure here at United. "We know he isn’t too happy with the way this deal has been forced upon him. "He realises he has more chance of playing at Arsenal, but he would have preferred to leave on his own terms." I don't know why Jose Mourinho still coaches, he is a terrible person and a lousy coach, don't know how to get the best from his players. Very petty and selfish thinking that the beautiful game of football is all about him. Henrikh Mkhitaryan provided three assists on a dream home debut as Arsenal cruised to a 5-1 victory over Everton at the Emirates Stadium. The Armenia international joined the Gunners last month from Manchester United in a swap deal which saw Alexis Sanchez move in the opposite direction. Mkhitaryan struggled to showcase his creative talents under Jose Mourinho at Old Trafford but the early evidence suggests he will thrive under Arsene Wenger. After an encouraging cameo performance against Swansea in midweek, the 29-year-old took just six minutes to lay on Aaaron Ramsey’s opener, latching onto fellow home debutant Pierre-Emerick Aubameyang’s and lashing a low centre across goal for the Welshman to tap home. Eight minutes before the break the former Borussia Dortmund stars were at it again, with Mkhitaryan feeding Aubameyang, admittedly in an offside position, who delicately flicked the ball over the advancing Jordan Pickford. Mkhitaryan completed at hat-trick of assists with 16 minutes remaining, again firing the ball across the penalty area from the left wing, allowing Aaron Ramsey the chance to sweep home the first treble of his Premier League career. Even Jose Mourinho admitted both clubs secured themselves great deals when Mkhitaryan and Aubameyang swapped teams, but Arsenal fans who became frustrated by their old No.7’s selfish playing style are already enjoying their new one’s selfless attitude. Sanchez, who opened his goalscoring account in fortuitous circumstances for United on Saturday, provided three assists in 19 matches for the Gunners this season and Mkhitaryan has already equaled that tally in the space of 90 minutes. 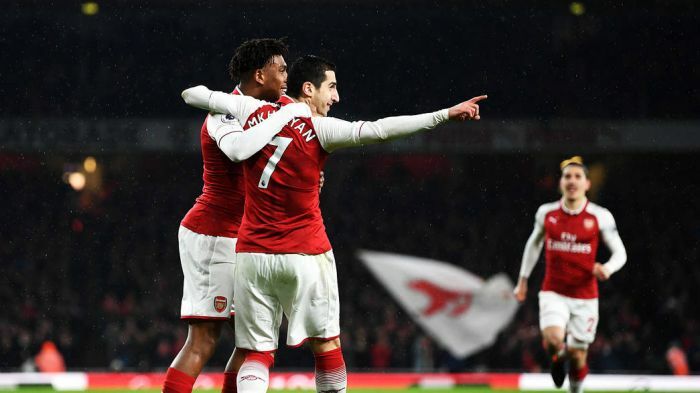 Nigeria midfielder Alex Iwobi has lauded his Arsenal newcomer teammate, Armenia midfielder Henrikh Mkhitaryan’s astonishing performance during their English Premier League football clash against Everton. At the match that was played on Saturday evening in London, Arsenal won at home by a score of 5-1, Armenia captain Henrikh Mkhitaryan started for the Gunners for the first time, played the full game, made three assists, and Whoscored.com named him Man of the Match. Stupid Jose Mourinho lost a great player! But than again he is a bad overrated caoch. been named best player of the Europa League clash versus Ostersunds. poll to determine their best player of the match. Monreal and Ozil gained 15% and 22% respectively. the Ostersunds Europa League clash. “"He has worked very hard, I think it was a positive performance,"
international provided the assist for Ozil’s goal. Edited by Yervant1, 18 February 2018 - 12:38 PM. YEREVAN, MARCH 2, ARMENPRESS. 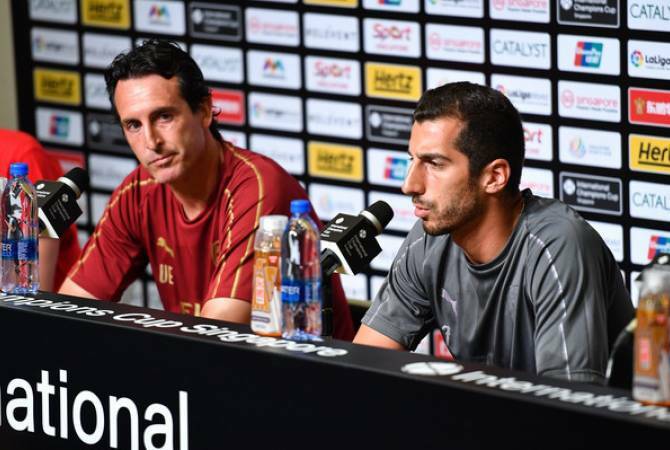 Head coach of London’s Arsenal Unai Emery praised midfielder, captain of Armenia’s national football team Henrikh Mkhitaryan, reports Armenpress. Arsenal boss said Henrikh Mkhitaryan is a very good person, he can speak a lot of languages. “He has experienced a lot of countries. As a player he is making a good career. And I think he can also improve and can also write a new history for himself”, the Arsenal head coach said. Unai Emery added that Mkhitaryan can play in different positions and help the team like a winger – right, left and inside. “For us he is very important because every player likes him a lot”, he said.